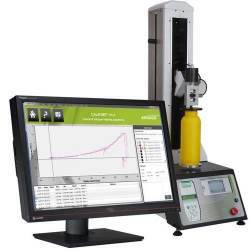 ANDILOG's STENTOR II provides a complete, ready to use top compression force measurement system for use on PET plastic bottles or containers required in the packaging, pharmaceutical and beverage industries. 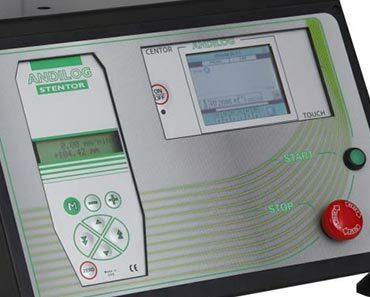 Thanks to the features of the STENTOR II, performing a top load test has never been simpler. 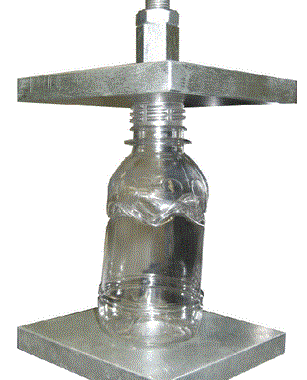 This model offers the advantage to measure and display in real time the axial compression force applied to the bottle, and to set a deflection limit. 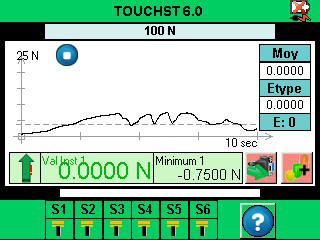 The color touch screen also simultaneously displays the curve, the force applied and the maximum compression or the force at deflection value. ANDILOG offers two complete, all-in-one TOP LOAD test systems (which include motorized test stand, an integrated controller, a load cell and two compression platen). Those pre-configured systems allow for quick, easy setups along with accurate repetitive and comprehensive measurements. 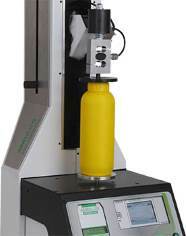 The TOP LOAD 1000/2000 provides an easy method for carrying out compression tests on bottles or other small containers, of any shape. These instruments can be used in workshops or laboratory environments. All of these tests and methods can be performed with an ANDILOG TOP LOAD tester. An operator places a test bottle (or container) atop the wide bottom platen, which is threaded to the test stand's working table, then presses the START button. The trop compression platen automatically travels down (at a fixed speed) and applies a compression force to the botle. As the test is being performed, the test data (force, travel distance and the force vs. travel curve) is displayed, in real time. Once the test's condition have been met, it returns to its original position in readiness for the next bottle/test. The color touch screen simultaneously displays the curve, the force applied and the maximum compression, or the force at deflection value or the break point. DATASTICK II (optional): save results and curves on a USB drive and then export them to a computer. CALIFORT (optional): advanced command and analysis software that allows you to maximize the use of your material testing system; setup and control complex test sequences, ensure data traceability and autoamatically produce test reports. 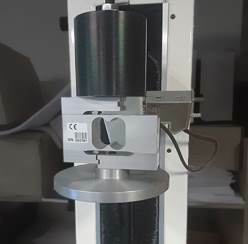 TOP LOAD testers are supplied with a highly accurate force load cell designed to provide repeatable results. The force accuracy is 0.1% of the load cell's capacity and with a data acquisition of 1000Hz. The force load cells are equipped with Plug and Play SPIP technology, which stores all theirs calibration parameters. You can swap out a load cell in accordance with your testing requirement; the load cell is automatically recognized by ANDILOG’s TOP LOAD testers.